On a summer afternoon, the sounds of children babbling behind closed doors spills into the otherwise deserted halls of an east Toronto student residence. 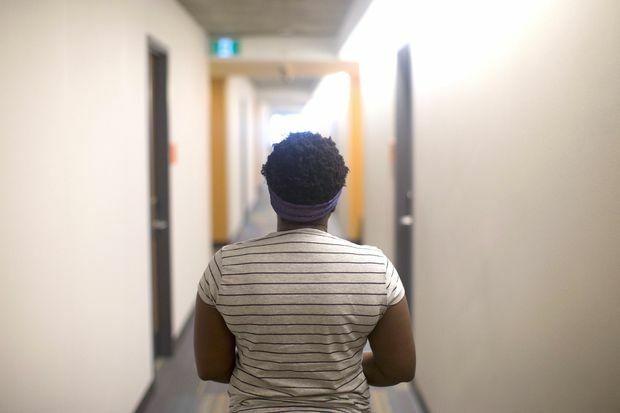 Mariam Oyagbohun, a Nigerian migrant is being temporarily housed in a Centennial College residence. “We realized that [U.S. President Donald] Trump does not want immigrants,” the woman said. From Florida, the couple went to New York State, where they got on a bus to Montreal. The federal government has offered $11-million to Ontario to offset immediate housing costs, but the provincial government said that will cover a fraction of the costs incurred in Toronto alone. “We are very mindful of the August 9 deadline and so we are working on a number of options,” he said, although he gave no further details. Many have received a social-insurance number and a work permit, but said jobs and homes have been hard to find, as they can’t provide landlords with pay stubs or credit checks. A competitive rental housing market makes finding a suitable home even more challenging, they said. “How can I look for an apartment when I don’t have a job? And if I have a job, how can I look for an apartment?” he said.